�����This week Gold begins at $1,275 and Silver is at $16.28. Proof Silver Eagles are very active and are now trading at $36-$38 wholesale. One of the more popular Proof Silver Eagles has been the low mintage 1995 W. Several years ago the PCGS PR70 Deep Cameo traded above the $70,000 level, but that was when the population was under 10. Since then the pop has increased substantially and the wholesale price is at the $16,000 mark. �����The PR69 Deep Cameo Silver Eagle has been trading between $3,200 and $3,300 with still plenty more available. The original 1995 Proof Eagle set including the Silver and Gold coins has been trading around $5,450 to $5,600 over the past several weeks. This set had been above the $6,000 price for the previous year. 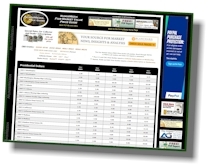 �����In this week�s LD Wholesale Market Dealer Price Guide, the adjustments are mostly prices dropping to even lower levels. However, as more prices fall in some series, there seems to be more trading at the lower levels. 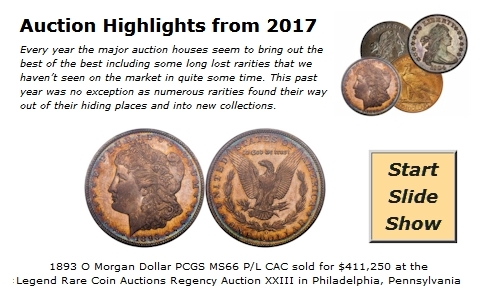 Early Lincoln Cent prices have been declining over the last year, but sales are now increasing and so have some of the Lincoln prices. Below are a few of the increases this week. �����Prices are trending up in the Two Cent piece chart this week. The 1864 Small Motto in MS64 Red up to $2,925 Market and the 1866 MS66 RB now at $1,825. 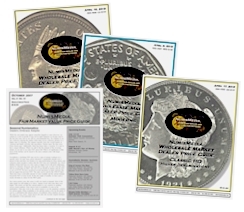 Two Cent Proof issues appear to be solid at current levels with the 1868 PR67 RB higher at $5,525 Market and the 1872 PR66 Red advancing to $6,750.